I talk quite a bit about pantry-inspired meals. I firmly believe if you keep a well-stocked pantry, you are never without a solid meal. These turmeric chickpeas are a perfect example of pantry-inspired. Each ingredient for the core recipe is an item I always keep on hand, including the shallots and garlic. These chickpeas are easy to whip together and make for a solid dinner base. My favorite part? It’s easy to bulk up the recipe with greens, squash, and/or sweet potatoes. 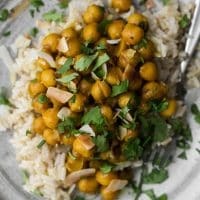 These turmeric chickpeas come together in 20 minutes- a perfect weeknight dinner that is filling and full of flavor. Heat a pot or dutch oven over medium-low heat. Add the shallot and cook for 3 to 4 minutes, until soft and fragrant. Stir in the garlic and ginger, cooking for another 1 to 2 minutes. Add the turmeric and salt followed by the coconut milk and muscovado sugar. Bring to a boil, reduce to a simmer then add the chickpeas. Cover and cook for 10 minutes to let the flavors develop and the chickpeas soften. 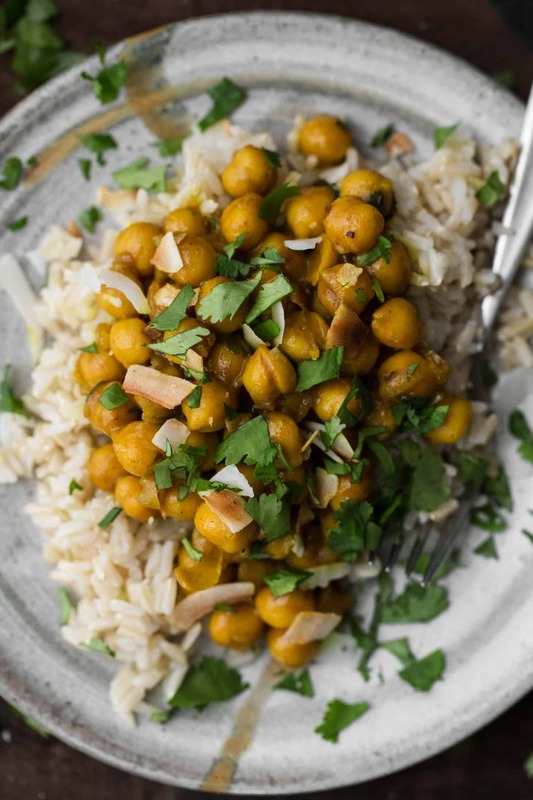 Serve the turmeric chickpeas over the rice and sprinkle with cilantro. Serve with lemon wedges and fresh avocado. Tips and Tricks: This is a really rich dish because of the coconut milk. If you want to cut down on the calories and fat, replace part of the coconut milk with vegetable broth. Also, this recipe uses the coconut milk in a can. I recommend pouring the coconut milk into a storage container with a lid and shake until well combined. 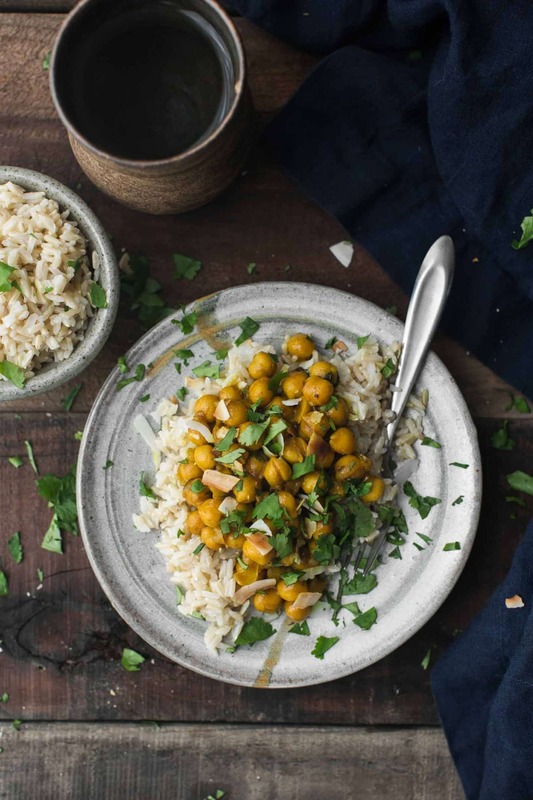 As mentioned above, these turmeric chickpeas can be served as is but also make for an excellent base for other produce, depending on what you might have available. Sweetness: I love the depth the muscovado sugar adds to the overall flavor of the dish but if you’re looking for non-sugar based sweeteners, golden raisins or dates would be lovely as well. Add these in with the chickpeas. Greens: I wanted to keep this dish simple but you could easily add kale, chard, or spinach at the end of cooking. Grains: If you don’t have brown rice ready and still want to make this a 20 minute meal, serve the turmeric chickpeas with millet or quinoa- both can be ready in 20 minutes. Chickpeas are always in my pantry. They make a quick meal, like these turmeric chickpeas, but can also serve as a great dip, deli sandwich, or addition to soup. They are versatile and a power boost to any meal. If using dates to sweeten, how much would you put in? The recipe sounds simple and delicious! Perfect for a cold night! I’d probably do about 4 dates, chopped fairly fine. You could also start with less and add more after tasting! The nice thing about this recipe is it can stand to simmer for a bit longer if need be. 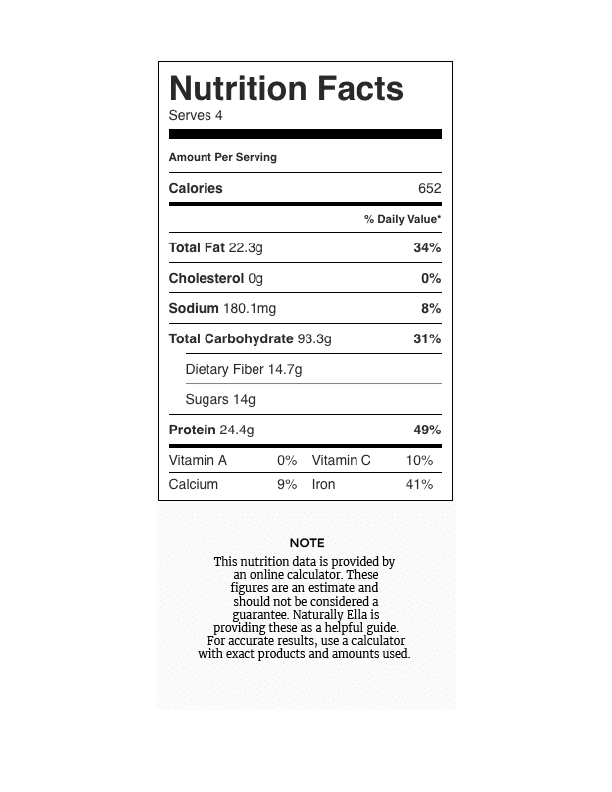 Does the nutritional info include the rice? So far I am not too happy with the recipe. 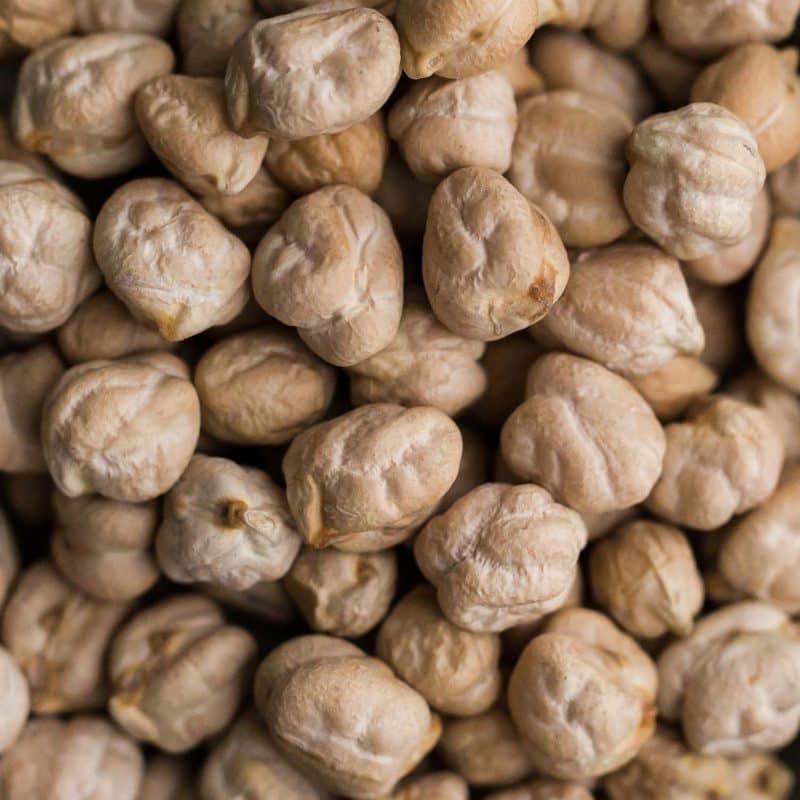 You don’t indicate different instructions for the type of chickpea, canned would cook easily in ten minutes because they are already soft, but hard chickpeas can take 2 to 4 hours according to other sources on the web. I have put in twice the amount of liquid, they have been cooking for 45 minutes and have a long way to go because i did not use the canned chickpeas for this recipe. My suggestion is to indicate how to properly soak and cook dried chickpeas that are not canned and then indicate the difference between them. The recipe sounds like you would follow your instructions even if they are dried and not previously cooked, and only indicating to rinse them if they are canned. The two types would be handled quite differently. I’m sorry for the confusion- I see where if you haven’t cooked with chickpeas before, it could cause problems. I have an entire page devoted to chickpeas that talks about soaking and cooking. All recipes I post require cooked chickpeas unless otherwise noted. I love this recipie, I’ve made it many times. I often add butternut squash and spinach. Loved this recipe. Perfect for a rainy day. I do think it needs a little more salt, but not a whole lot. Will try with kale next time! I made this for lunch yesterday and it’s my new favorite recipe! Instead of rice, I put some of the chickpeas over fresh arugula. I am not able to use coconut milk because of a coconut intolerance. What couldI use as a substitute? Thanks so much for this recipe-I’m a long time reader of your blog but a first time commenter. 🙂 We make this dish regularly and my husband, toddlers (!) and I all love it. It’s so simple and requires very little chopping and yet is so delicious. We add fresh spinach straight in the sauce. My toddlers eat it with peas. Thanks for sharing this!